I’ve got to give most of the credit for these Halloween wreaths to my 7-year-old. She’s got some great ideas. I had a much different wreath in mind and only got as far as the first step before she took over and made the perfect spider web wreath. I love it when the kids take over. They’re ideas are always so much better than my own! And because my daughter called the shots, the craft not only turned out cute, but it was also a fun process for her. 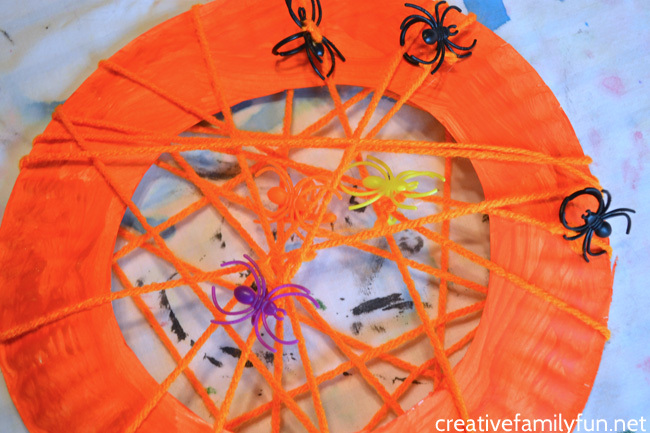 This Halloween spider web wreath is fun to make and appropriate for preschoolers as well as elementary-aged kids. It’s easy to adapt to differing skill levels and is open to a child’s individual creativity. Start by cutting the middle out of your paper plate. If you’re working with young kids, you may want to do this step ahead of time, since you’ll need sharp scissors to do this task. 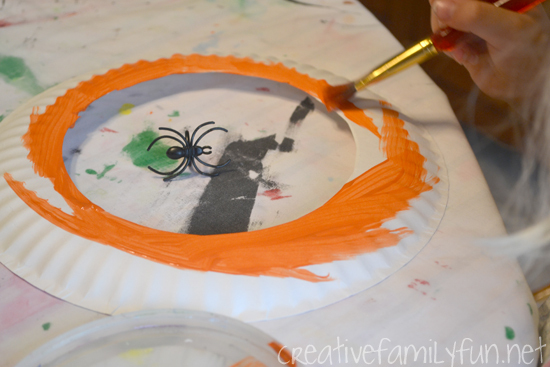 Flip your paper plate so that the bottom side is facing up and then paint the entire wreath orange. 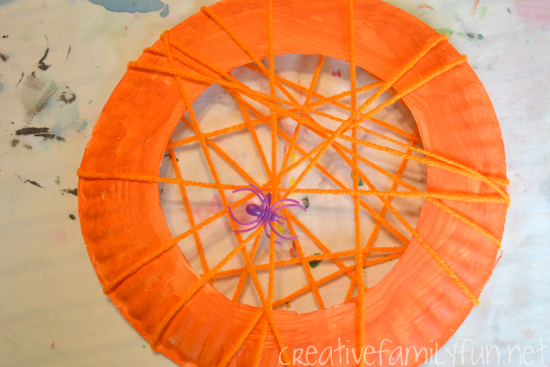 If you don’t want an orange wreath, another fun option would be to paint your paper plate black and use orange yarn for your spider web. 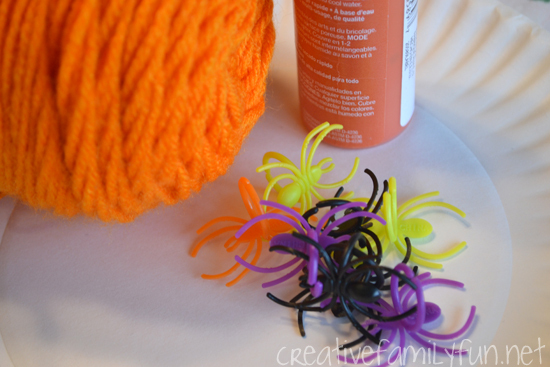 Once your wreath is dry, cut a long length of orange yarn (several feet!). 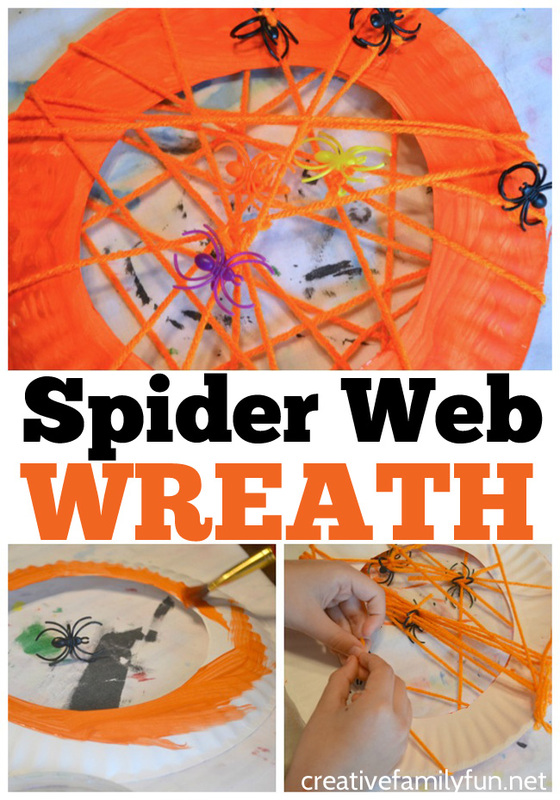 It needs to be long enough to wrap around the plate many times for your spider web. Tape one end of the yarn to the back of your wreath with clear tape. Start wrapping the yarn around the wreath in all different directions. Go back and forth, sideways, diagonally, and around and around. Keep wrapping until you reach the end of your yarn piece. Secure the other end of the yarn to the back of your wreath with tape. 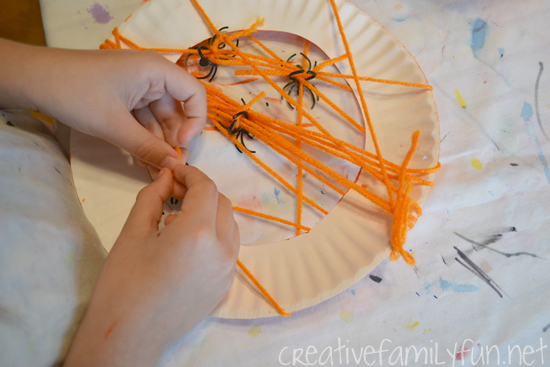 We found that using small pieces of yarn to tie our spider rings to the web worked best. Add as many spiders as you want. We had a few busy, busy spider webs! Note: This post was originally published on October 17, 2014. Updated and republished on October 4, 2018. Most of the projects we’ve done for Halloween have been crafts. We do love crafts, especially holiday crafts. 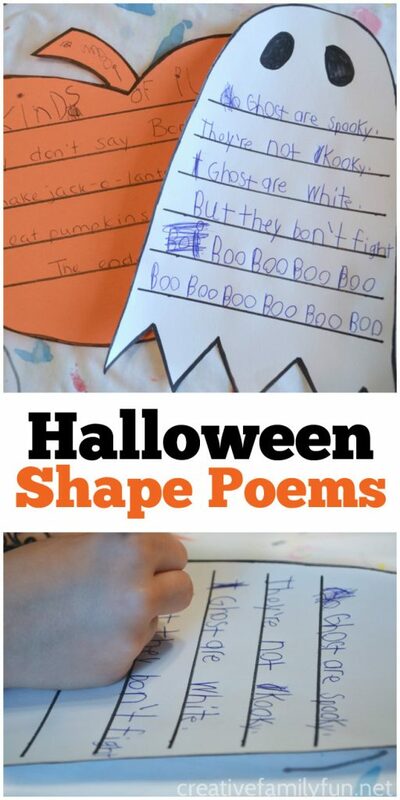 But, I did want to sneak in a little learning with some Halloween Shape Poems. My 2nd grader can get overwhelmed quite easily when it comes to writing, but she’s always responded well to poetry. 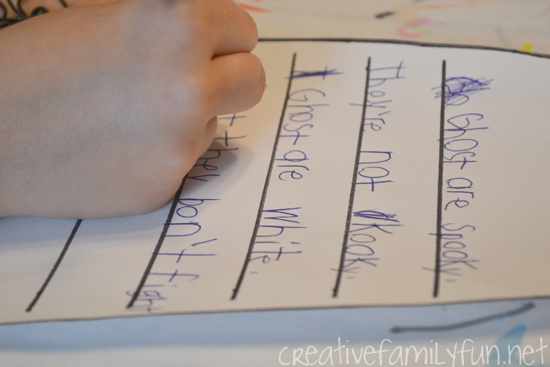 She gets excited about writing poetry, so many of our at-home writing projects are about poetry. When considering after school projects, it’s important to keep your kids interests in mind. I don’t want to contribute to burn out! I kept the set-up for this project easy by going with simple Halloween-inspired shapes. I don’t have any printables for you this time because I drew the shapes on construction paper. We used a ghost and a pumpkin. A witch’s hat and candy corn are a couple of other simple shapes you could consider. Don’t worry about perfection. My pumpkin is a bit wonky, but I think I’m the only one that noticed! Draw your shape, outline it in black, and cut it out. Then, take a ruler and draw straight lines approximately 1-1/2 inches apart. My girls still write big, so I wanted to give them plenty of room. Plus, I didn’t want to overwhelm them with too many lines. 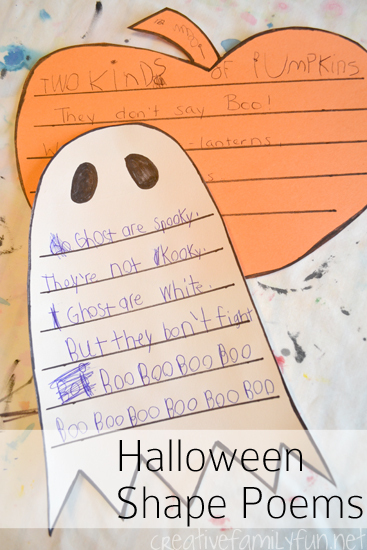 The fun thing about these Halloween shape poems is that you already know your subject. Your subject is the shape of your paper. Sometimes choosing a topic can be the biggest hurdle to jump when it comes to creative writing. The only rules about shape poems are that the poem should be about the shape and it should fit inside the shape. Other than that, anything goes! Each girl wrote at their own level. My 2nd grader decided to write a rhyming poem and had fun with some silly rhymes. My kindergartner just wrote a few lines about pumpkins. She came up with the lines and I wrote them for her. This is not a project I would have done with her alone at this point, but because she always wants to participate, I gave her extra help to keep it skill appropriate. I love the poems the girls came up with and they are quite pleased with it themselves. They’ve already added music to the ghost poem. If they keep that up, I may have to start calling them aspiring song writers. Note: This post was originally published on October 21, 2014. Updated and republished October 2, 2018. 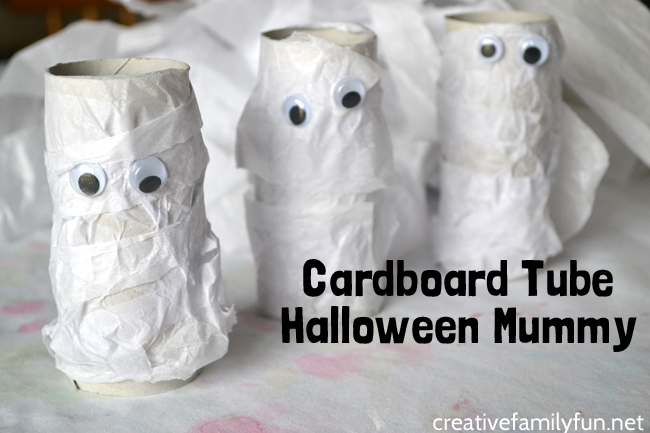 These Halloween mummies are spooky; they’re kooky; and they’re a whole lot of fun! Gah! Just look at those googly eyes! 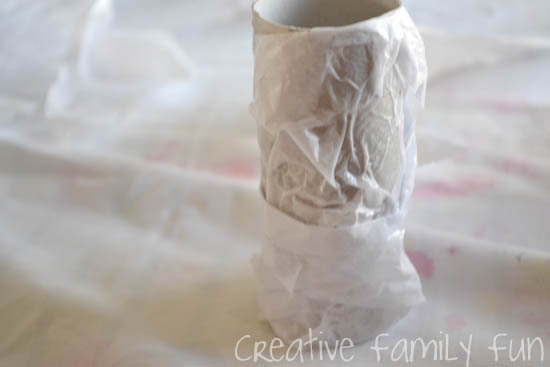 Your kids will love making this simple Halloween mummy craft just as much as my kids did. The process is simple and you probably already have all the supplies you need. 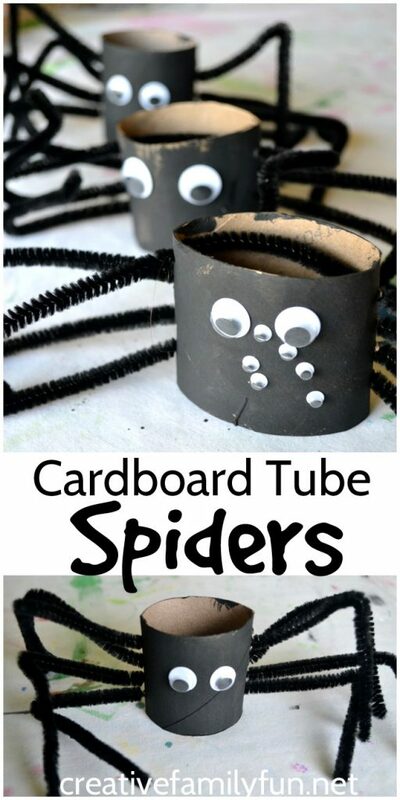 So, let’s gather supplies, grab the kids, and start crafting for Halloween. 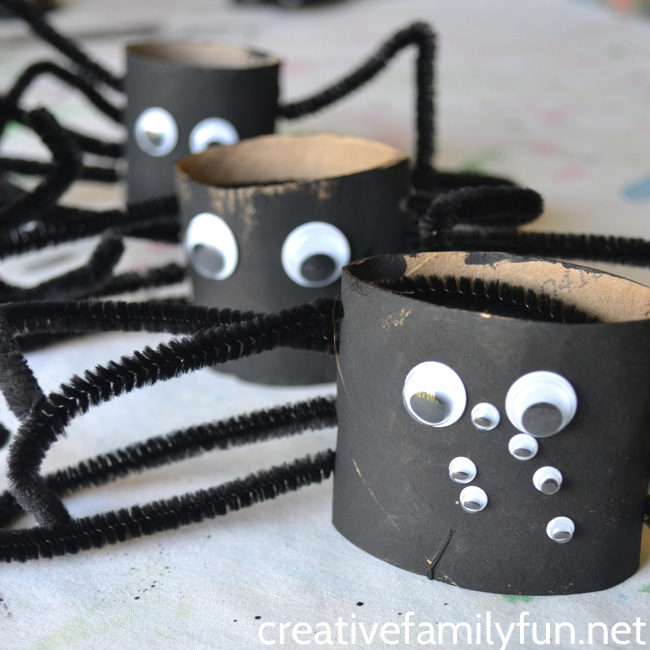 We got out the empty cardboard tubes again, along with the googly eyes that we used for another fun set of Halloween characters. But, this time we made a cute Halloween mummy. To prepare, you will want to thin your glue with water. I used regular school glue combined with water in a 1-1 ratio. Mix it well and it will work similar to ModPodge. If you don’t thin the glue, it will be too thick to work properly for this project. We used small sponges to spread our glue. 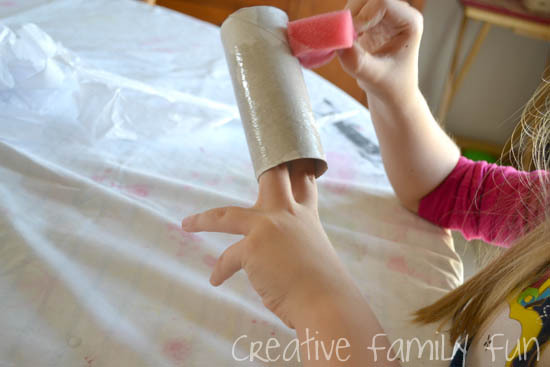 I wanted the girls to be able to spread a lot of glue quickly and the sponges did the trick. 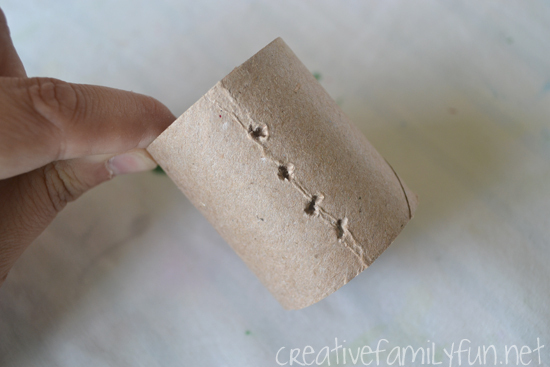 Spread the glue on your cardboard tube and start wrapping your strips of tissue paper around it. 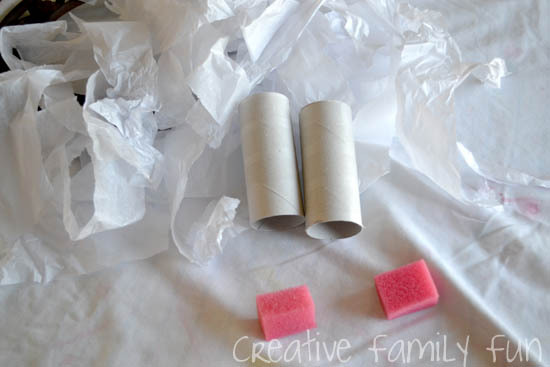 Once you have one layer of tissue paper on, spread some glue over top of your tissue paper and wrap some more tissue paper around your tube. The water/glue mixture will not get gloopy or clumpy. If you dab your sponge on top of the tissue paper instead of smearing, your tissue paper will not tear. And, if your tissue paper does tear, you won’t notice. We’re making mummies after all! Once you are satisfied with your wrapping, set your tube aside and walk away until it dries. It will look like a wet mess (see above picture), but once everything is dry, you’ll have a mummy. 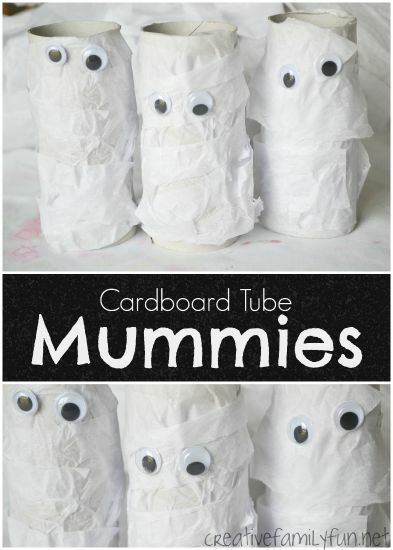 After your mummies are dry, glue on the googly eyes. 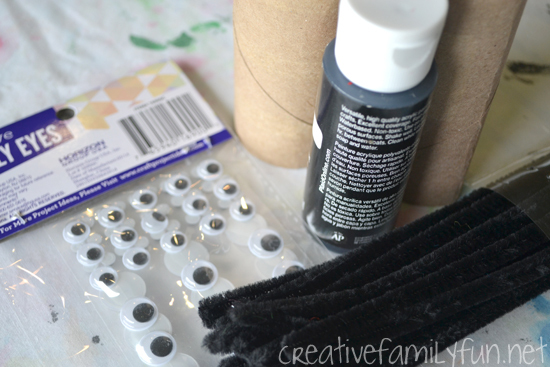 This time, use regular-strength glue and not your thinned out glue for the eyes. That’s it! Your Halloween mummies are finished! Aren’t they cute? 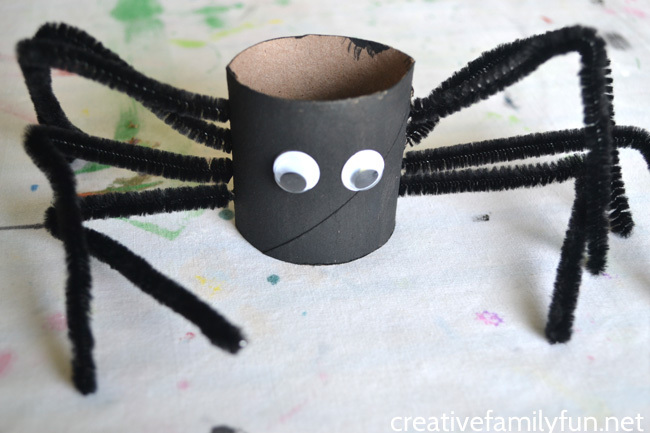 If you enjoyed this Halloween Mummy craft, the picture below is perfect for sharing on Facebook or saving on Pinterest. Ghosts can be a scary idea, but when it comes to Halloween decorations, they’re often more friendly than they are scary. 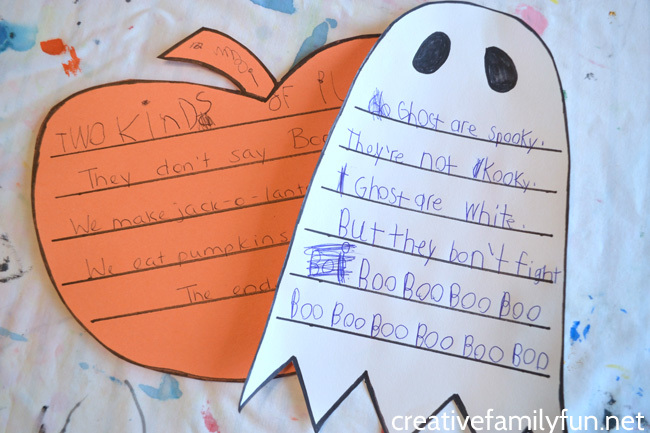 And, that’s the case with all of these fun ghost crafts for kids. These ghosts are fun, cute, friendly, and not the least bit spooky. 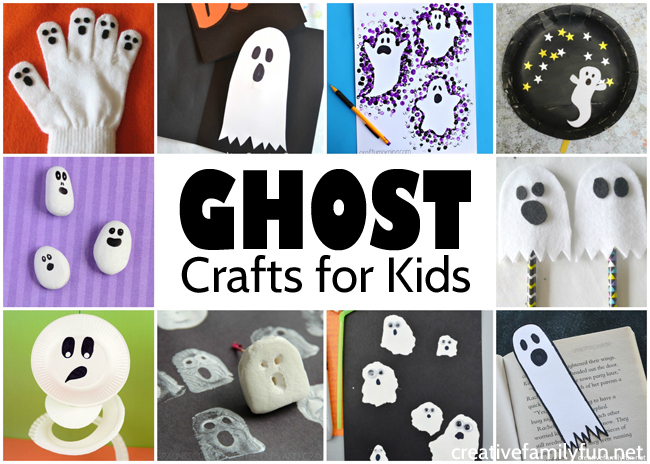 These awesome ghost crafts are fun for kids of all ages. 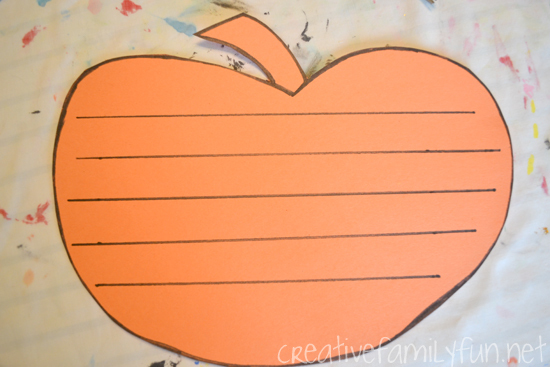 Let your preschoolers try a fun printmaking project when they try a potato print banner. 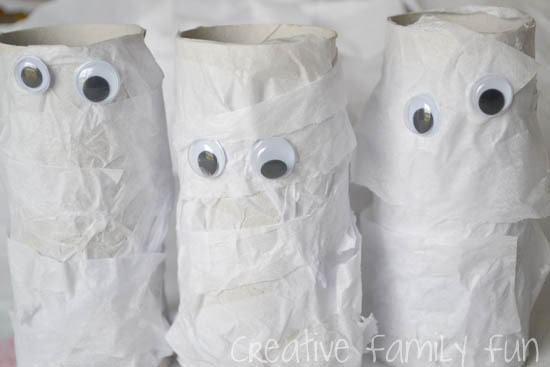 Or your tweens may enjoy making some no-sew ghost pencil toppers for their friends. Mark your place in your favorite book with our simple Ghost Bookmark. Our No-Sew Ghost Pencil Toppers are a fun gift to make for your friends. Send a smile in the mail with our Ghost Pop-Up Card. This easy No-Sew Ghost Hand Puppet from Mama Smiles is also a fun toy. 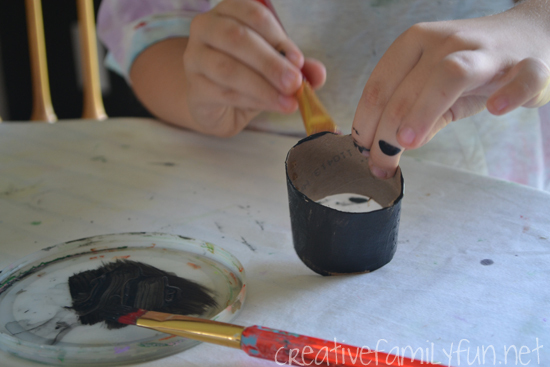 Use marshmallows to create this fun Ghost Stamp Craft from Coffee Cups and Crayons. Get inspired by nature when you make these Spooky Leaf Ghosts from Mother Natured. 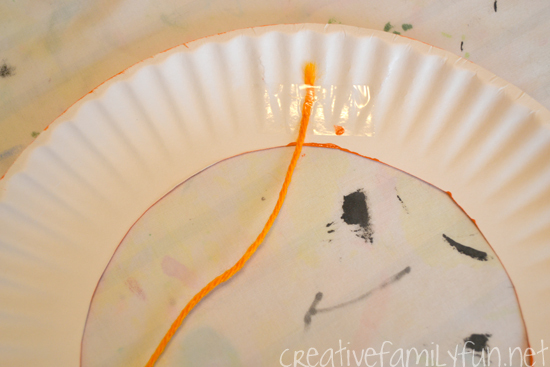 This Paper Plate Ghost from Easy Peasy and Fun would be an awesome hanging Halloween decoration. 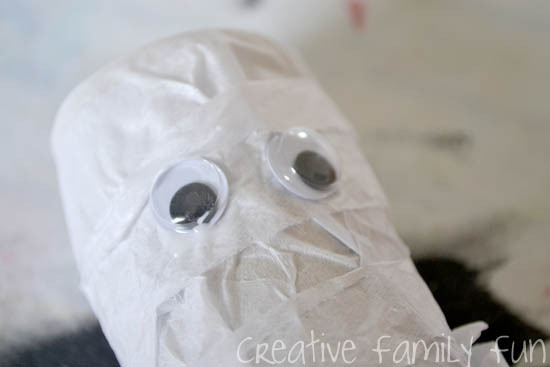 Use fabric squares to make these fun Fabric Ghosts from Buggy and Buddy. 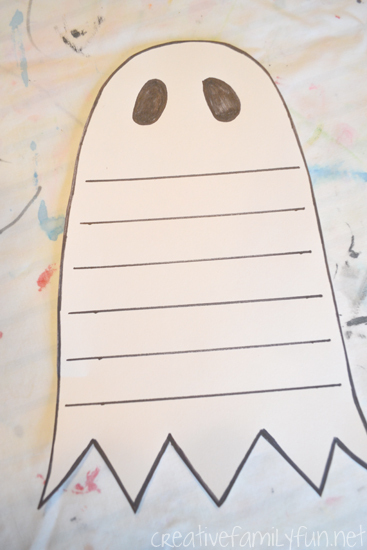 This Pencil Eraser Ghost Craft from Crafty Morning is easy to make using a printable template. These simple Cotton Ball Ghosts from Happy Hooligans are so much fun to make. 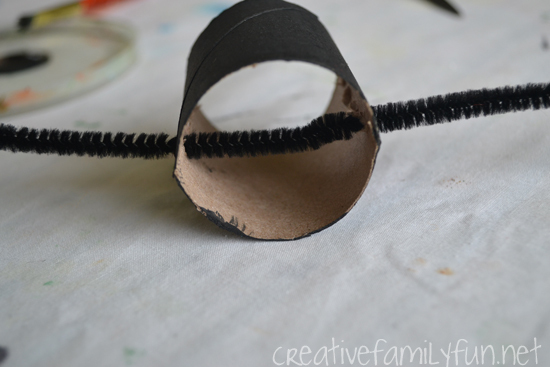 Get creative when you make this Straw-Blown Ghost Craft from Rainy Day Mum. 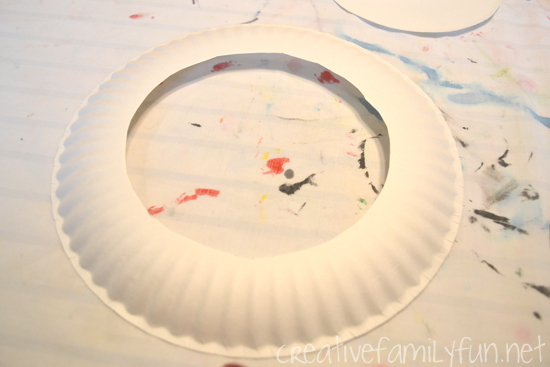 This Moveable Paper Plate Ghost Craft from Crafts on Sea is both fun to make and fun to play with. Gather a few rocks to make these awesome Painted Rock Ghosts from Easy Peasy and Fun. Start folding to make this easy Origami Ghost Garland from Red Ted Art. This Potato Print Ghost Banner from No Time for Flashcards is a fun printmaking project. 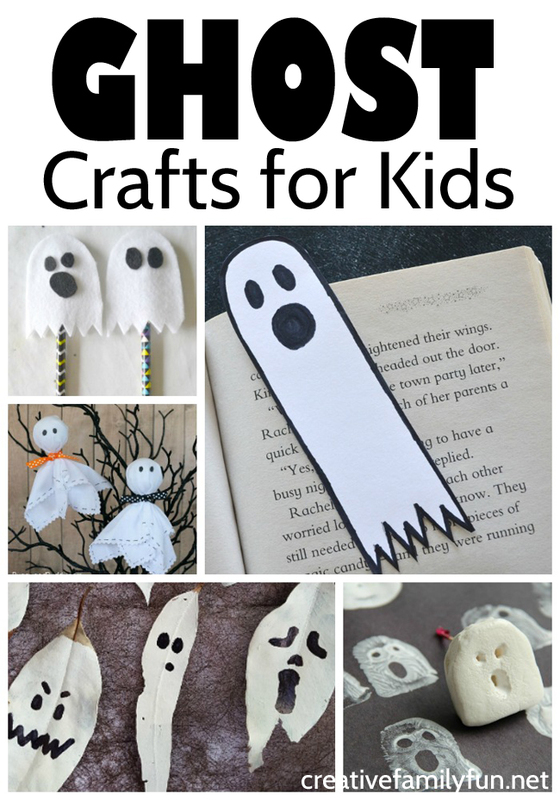 Which of these fun ghost crafts for kids are you going to make?